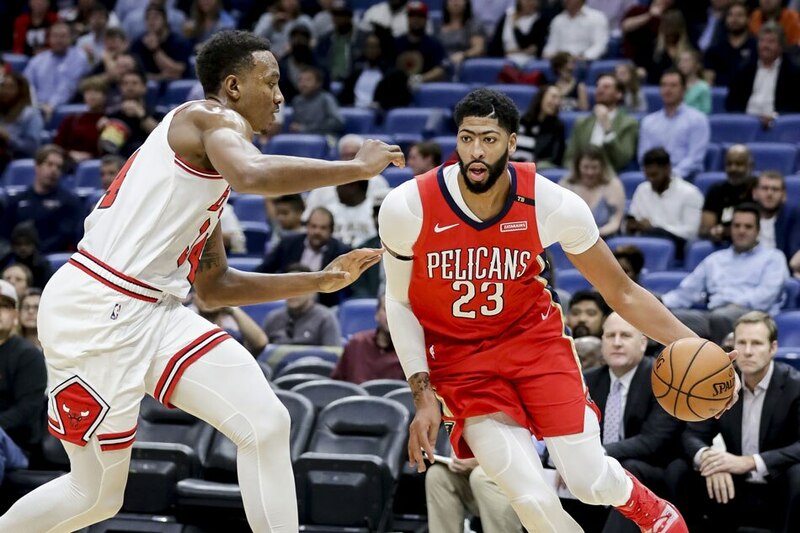 Anthony Davis had 32 points and 15 rebounds as the host New Orleans Pelicans ended a six-game losing streak with a 107-98 victory against the Chicago Bulls on Wednesday night. Davis, who missed three games and struggled in three others during the losing streak because of an elbow strain, looked his old self as he added seven assists. Zach LaVine led the Bulls with 22 points, Jabari Parker had 20 points and 13 rebounds, Wendell Carter Jr. had 17 points and 11 rebounds, Justin Holiday scored 17 and Ryan Arcidiacono scored 11. New Orleans led 58-50 at the half, and after Chicago cut the deficit to 65-59 with 8:31 to go in the third quarter Davis took over. He assisted on a Johnson 3-pointer, made two free throws, assisted on a Johnson layup, then after a Jrue Holiday free throw, Davis assisted on a Holiday basket and made a dunk to complete a 12-0 run for a 77-59 lead with 5:03 to go in the quarter. LaVine scored six points as the Bulls trimmed the deficit to 85-72 after three. Miller and Randle made consecutive jumpers to start the fourth-quarter scoring and give New Orleans an 89-72 lead. Justin Holiday scored seven points during a 13-2 run that got the Bulls within 91-85 with 6:33 to go. Jrue Holiday converted a three-point play and LaVine answered with a 3-pointer before consecutive baskets by Davis and Johnson gave the Pelicans a 98-88 lead at the 4:19 mark. Chicago got within six, but consecutive baskets by Jrue Holiday and Randle pushed the lead to 102-92 with 1:55 left. The score was tied five times in the first quarter before Davis finished with a flourish. He scored consecutive baskets and assisted on a basket by Ian Clark that gave New Orleans a 29-26 lead after the opening period. Randle scored New Orleans' first five points of the second quarter and Miller added a 3-pointer as the Pelicans took a 37-30 lead. Each time the Bulls started to make a move, Davis had an answer. Chicago came within five points before Davis made a layup and New Orleans rebuilt the lead to 12. Chicago came within seven, but Davis answered with a 3-pointer. LaVine's layup pulled Chicago within 58-50 at halftime.